Huntsman Architectural Group recently completed the design and installation of a larger office space for San Francisco-based creative agency Tolleson. The office’s design uses the 1910 warehouse’s rustic office aesthetic, with skylights, wood floors, exposed timber trusses and brick walls to create an environment which better suits the firm’s client engagement, collaborative work, and technical production needs. “For Tolleson, a nationally recognized branding and creative agency, a relocation to 560 Pacific in San Francisco’s Barbary Coast represents the third iteration of its studio evolution as well as partnership with Huntsman and Design Workshops. Formerly the home and showroom for the Amtico flooring company, this two-story masonry and timber warehouse embodied many of the original office’s rustic characteristics such as exposed brick walls and wood trusses, wood floors, and skylights. The building owner, Birmingham Development, specializes in the redevelopment of unique and historic properties in San Francisco and also served as the general contractor for this turnkey office delivery. Working in tandem with Birmingham, Huntsman began to explore fitting Tolleson’s program into the 11,000 square foot upper floor while evaluating existing conditions to preserve, retrofit, and replace. Coming from a 3,500 square foot space, Tolleson had the opportunity to configure its new office to better relate to how the firm currently works with its clients. This translated into a suite of spaces catering to client engagement, an expansion of the studio, and the addition of specialty functions such as video and audio editing and a photography studio. Huntsman planned the long, shoebox footprint of the building so the overall functionality maximizes space efficiency and circulation throughout. As visitors enter the building, they ascend to the second floor where reception and lounge await. At the helm of the office, a library, reading area, and lounge line the perimeter of the main conference room. Collaborating with Design Workshops, Huntsman designed the conference room to read as a floating volume within the warehouse space. Many of the features of the original office come into play here in the new location; the reception desk is made of hot rolled steel – a technique that defined the design direction of Tolleson’s first studio. Timber trusses and posts were bead-blasted to reflect the original redwood warmth and color. New steel beams form the edges of the room and define a contrast with the original construction. 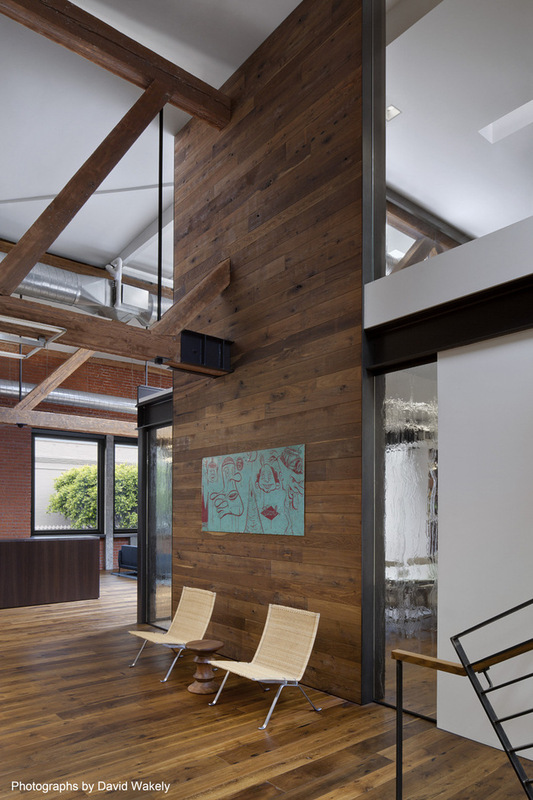 Reclaimed wood from former barns clad the sides of the room and extend up to a mezzanine level which was added as part of the building renovation. Four four-feet wide pivoting doors open the room to the surrounding space. Rippled glass panels hark back to the design elements of the first Tolleson office and provide both transparency and privacy. Flanked by the conference room on the South end, the studio lies behind and is centrally situated on the floor. On one side, open collaborative areas house flat files and a shared bar-height table for impromptu meetings. On the other side of the studio, a photo studio and editing room for video and audio media are easily in reach. Full height steel doors and wall panels clad the photo studio and editing room and make for additional pin-up space for designers. An opening in the ceiling allows natural light from rooftop monitors to permeate the two spines of circulation. A magnetic white board made of back-painted glass introduces new material technology and offers a neutral canvas for pinning up client work. New steel beams and posts remain exposed and define the outline of the studio. Mid-century icons like Eames’ LCW chairs nestle around a string of hand-dimpled copper lamps in the war room, where designers brainstorm client-confidential ideas. On the North end, a kitchen and break room anchor the other side of the studio. Natural and rustic materials help further articulate the restored warehouse aesthetic. Locally made tiles from Heath Ceramics and marble make up the backsplash of the kitchen wall. Design Workshops fabricated cabinetry that conveniently and elegantly hides kitchen appliances as well as a custom bar-height counter lit by a Marcel Wanders designed lamp. Eames’ DSR chair make the perfect companion to an oversized white oak dining table.